I thought I had this figured out, but now I'm worried that I need a constant current source to set this up (I just read about them a few minutes ago, so I'm not sure). My initial plan was to run 1 wire to one end of the sensor, and two wires off the other to A0 and A1 on the ADS1115 to take a differential reading in order to account for resistance down the wires. But I think I need to control for the amperage that goes across the PT100. I think I had planned to do a circuit like in this other SO answer, but I'm not sure if that's what I actually need. Any guidance is very much appreciated. Using Ohm's Law, we can choose resistors to use to limit the amperage crossing the PT100. In my case, I determined a 3.9k ohm resistor in front of my two 100 ohm resistors (the second being the PT100) would limit the amps to where I need them. At most, the PT100 will see .805mA which is in the required .3mA to 1mA range, meaning we reduce the accuracy lost due to the PT100 self-heating. 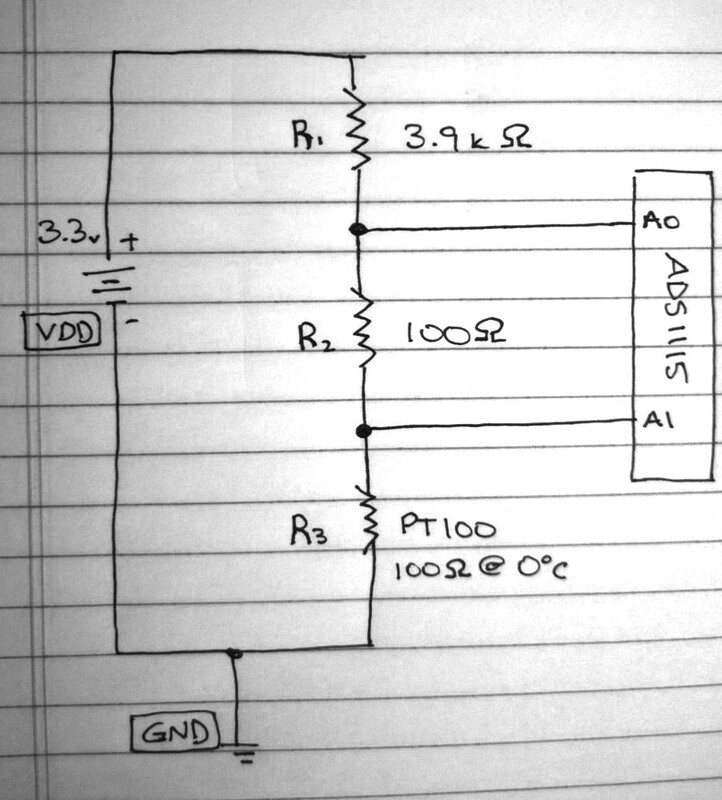 I read the voltages at pins A0 and A1, then compute the resistance of the PT100 using the equation in the link to the other SO question I posted in my question. In my code, I check to make sure A1 is not 0, and that the quantity (A0 / A1) - 1 is also not 0, otherwise we'll be attempting to divide by 0! Also since the highest voltage I care about is .218v, I can set the gain on the ADS1115 to 16x which puts full scale from 0 to .256v. Since the typical values we see will be on the range .08v to .218v we're losing out on some of the scale, but it's still pretty good as is! I had originally planned to use the PT100 with 3 wires, but one limitation of the ADS1115 is that it has a single result register, meaning I can only read 1 pin at a time! This means, at a data rate of 64, it takes roughly 1/64 of a second or 16ms to read a single pin! Given I have to read them serially since it can only store one result at a time, it takes 32ms to read both A0 and A1. I wanted to keep my loop as quick as possible, so I dropped the third wire. Find an ADC that can store multiple results at once. This would make the voltages read at pins A0 and A1 increase and decrease in a linear fashion, unlike what they do now. This would also mean I don't need the 3.9k ohm resistor, since I'm able to limit the current via the current source. If anyone sees any issues with my logic above or has their own recommendations, please do let me know!